ONC spoke with Loring about his filmmaking process, his intention in making The Age of Love, what he learned in the making of the film and his biggest take-aways from what turned out to be a true labor of love. Amy Phariss: Tell us how you got into filmmaking. Steven Loring: I’ve always been a writer and spent a decade in Hollywood writing TV scripts for Movies-of-the Week. When reality TV first appeared – shows like Fear Factor and Survivor – and killed the TV film genre, I migrated to the Web, and focused on writing and animation. But I’ve always loved research and storytelling, and the urge to get back out into the real world led me to film school. 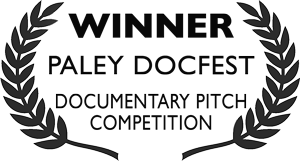 I learned how to shoot, record sound, edit, all the technical skills, and earned a degree in Social Documentary Filmmaking. The Age of Love was my thesis project. Amy Phariss: Why Social Documentary Filmmaking? Why didn’t you continue working in the big-budget film industry? Steven Loring: Well, I wasn’t a kid anymore, and rather than tell stories based on advertiser’s needs, I started to ask what stories were important to me, and how films could inspire people and maybe even change their lives. I wanted to address meaningful issues in the world, and, at the time, I was thinking a lot about age and love, so I started looking for a story to tell. 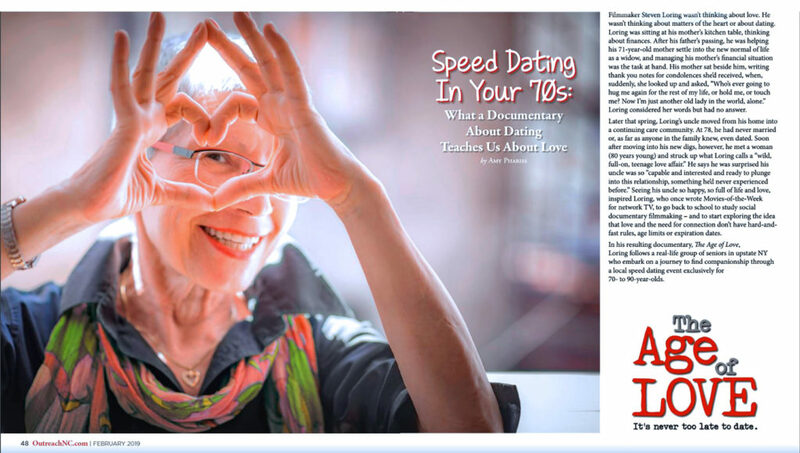 Amy Phariss: Why did you chose speed dating for people 70+? Steven Loring: My father’s passing had a big effect on me. I was able to help my mom with external needs – bills, managing the house, that sort of stuff – but who was going to help her with the emotional loss, the loneliness? Because I could see she was struggling. I remember a story she told me of the moment she realized my dad was really gone. At night, she said, when she got into bed, she’d reach over and hold my dad’s hand, which made her feel warm and safe. After he passed, she reached over one night without thinking and felt nothing but the cold sheet beside her – at that moment, she knew that she was truly alone. I knew there were probably a lot of older people who felt that way, but the media mostly ignored their hearts and emotional needs. In terms of love and connection, the assumption is that people over 70 are ‘beyond that’, or that new love at that age is ‘cute’ but not real. So I wrote in my notebook, “Does our need for love change as we row older? And if so, how?” I wanted to learn more not just for my mother’s sake, but because it’s a conversation our society needs to have. And now, as I’ve traveled the world with my film, I’ve seen how older singles have the same need for love and connection in India or Brazil or Japan as they do here. It’s universal. But, while we’re living so much longer now, we’re still looking at age from the perspective of caretaking and illness and decline, not in terms of new growth and connection. So it’s a story we don’t hear, but one that needs to be told. Amy Phariss: And there was your uncle? Steven Loring: Yeah, it was wonderful to see how happy he was. I could see a whole new world had opened up for him, after eight decades alone. I knew I wanted to tell a story that captured what I was observing: the struggles of my mom and the joy of my uncle. I wanted to find a window into this generation and let them speak for themselves. I wanted to bring audiences face-to-face with the emotions of older adults who have to work so hard against all our ageist stereotypes but won’t accept just being alone. Amy Phariss: How did you go about choosing the topic of speed dating as a vehicle to explore these issues? Amy Phariss: Wow. Did each of the participants react that way? Steven Loring: Twenty-nine of the thirty people immediately agreed to sign the release and participate in the film, and the 30th person agreed after we met. I was both stunned and thrilled that they were all eager to expose their emotional lives to the world. And everyone was ready to talk the first time I walked into their homes and set up the camera. They weren’t shy or embarrassed at all. Amy Phariss: Did anything surprise you while filming? Steven Loring: (thoughtful pause) I think I was startled by how strong their emotions were when I filmed them opening their results letters – the envelopes that revealed who they matched with at the dating event. You could see how seriously they took it. The desire to be liked and the fears of ‘if I like him, will he like me back?’ weren’t gone – I saw the same responses I’d expect from teenagers. All those feelings came right back to the surface. It was amazing to see how we don’t change fundamentally in seeking new relationships at any point in life. Amy Phariss: Is there any difference in how men and women react to speed dating? Steven Loring: It’s interesting, I’ve created and distributed a free Senior Speed Dating Kit to every community that screens the film, so I’ve observed a lot of speed dating events. In all but one or two speed dating events, men get on board. It just takes creativity to find enough men for the first event. Amy Phariss: That’s interesting. Do the men seem hesitant once they sign up? Do they seem to get as involved as the women? Steven Loring: Oh, for sure. Once they’re all dressed up and sitting across from so many eligible women, they realize how long it’s been since they’ve had a chance like this to open up and meet someone new. And they have fun. I think it showed in the film. Men took it just as seriously as the women – dressing and coming up with interesting questions to ask – they wanted to find connections as much as the women did. Amy Phariss: Tell us a little about the reaction you’ve seen outside of the U.S. You mention having gone to other countries? Steven Loring: Yes. I’ve screened the film in 14 countries so far. Russia, Australia, Canada, Greece, England, Brazil and more. It’s opened my eyes to the reality of the changing demographics of the world. Every country is aging. When I started out, I didn’t know if the movie would be understood by different socio-economic groups and cultures, but, so far, I’ve screened it everywhere from LGBT communities to upscale retirement communities to inner-city senior centers, in churches and synagogues and at international conferences, and even with subtitles in various languages. Yet audiences laugh at the same jokes and ask the same questions afterward. The sense I get is that being old and feeling overlooked and invisible has created its own minority that cuts across all cultures. As they live longer lives, people all over the world are experiencing ageism and loneliness. And, so far, little attention has been paid. Amy Phariss: Speaking of a particular sub-group, how has your family reacted? What does your mom think of what you’re doing? Amy Phariss: What have you learned about love through making this film? Amy Phariss: If you could sum up, after making this film, the one take-away you have from the entire experience, what would it be? Steven Loring: I guess I’d have to say…go home and ask your parents and grandparents what’s in their hearts, start the conversation, and it will enrich your life, too. Don’t be shy to ask older people what they’re feeling. Don’t wait until people are gone before you wonder about their emotional lives. Don’t let them feel like that speed dater on the phone who told me, “Even my own children never ask me what’s in my heart.